Nestled in Bolivia’s Cochabamba valley is the village of Tiraque. 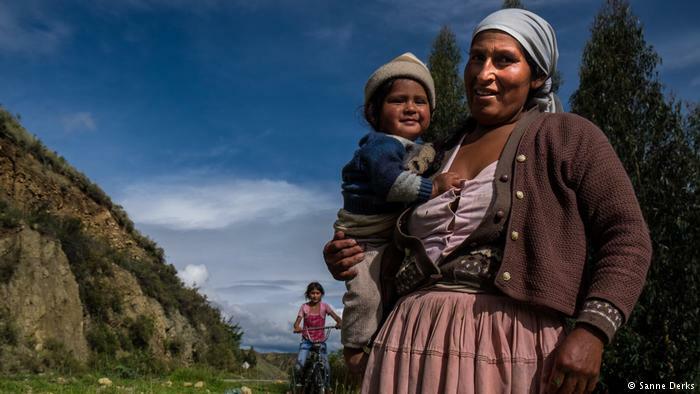 One of dozens of indigenous farming communities in the traditionally fertile local region, it sits at an altitude of 3,300 meters (10,800 feet). 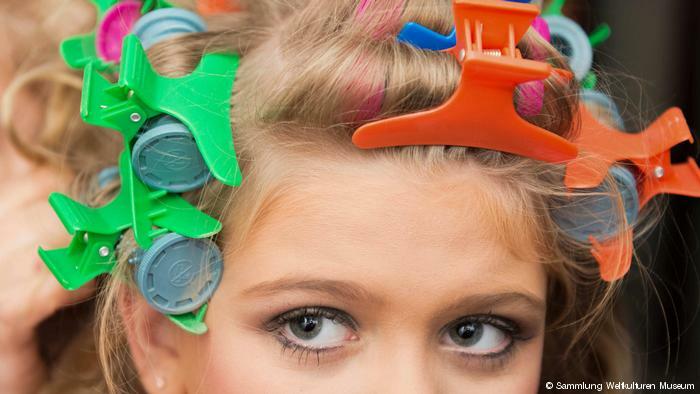 There, families live as they have for generations: from what they can cultivate. That has traditionally been potatoes, but changing weather patterns bring a need to adapt and think beyond habit. Particularly for women. The consequences of climate change are not evenly distributed — the poor are hit harder than the rich. Furthermore, gender plays a role: women are more vulnerable, as they are the ones responsible for production and preparation of food. This is especially the case in rural areas, where making a sustainable living is depends directly on agricultural production. Teresa Hosse is representative of the Bolivian Platform against Climate Change. She says the South American country’s unique composition of highland (Altiplano), valley and Amazon makes it among those worst-affected by the consequences of global warming. 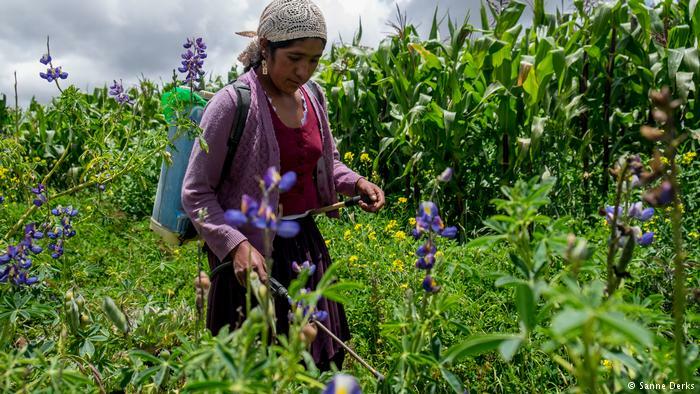 Juanita Terrazas (pictured above), who is now 23 years old, remembers a time when it was “so cold that only potatoes could grow here.” Carrying a plastic container of ecological herbicides on her back, she sprays the cauliflowers she has now been growing for the last three years. “The sun is coming closer, so it is much warmer than before, and that brings new plagues to our fields,” she says in reference to the tiny red spiders and aphids that wreak havoc. Although they may not understand the exact mechanics of global warming, women in Tiraque are well aware of how the climate is changing. 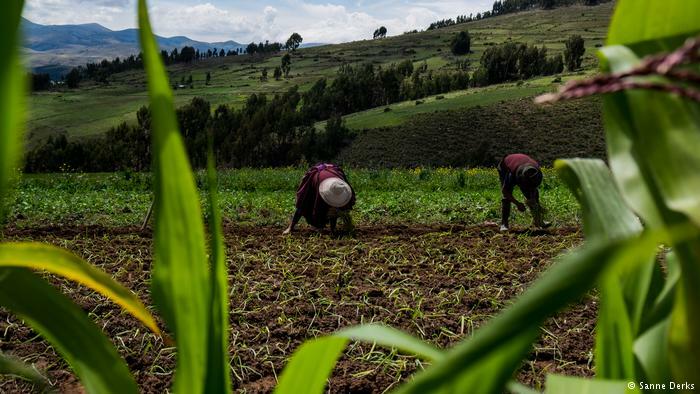 The average temperature, they say, is rising; the rainy season has shortened from four to two months; communities are being hit by drought; and the weather is less predictable, bringing more extremes such as floods and hailstorms. They have different explanations for these shifting weather patterns. 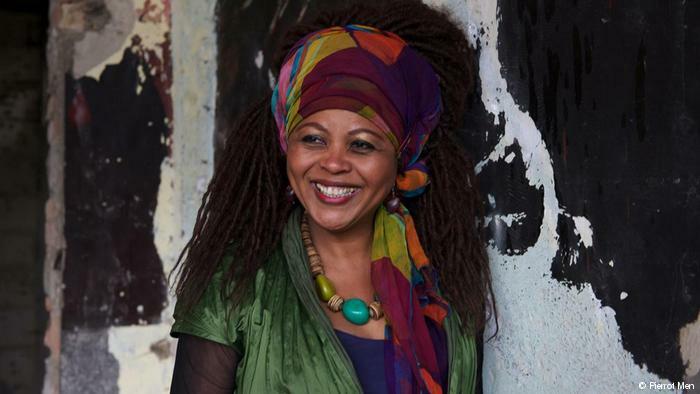 One woman says Pachamama, or Mother Earth, is tired of producing; another believes the sun coming through the hole in the ozone layer is so strong that it vaporizes the rain before it can hit the earth. Other women hold cars, asphalt and factories outside Bolivia responsible. As it is no longer possible to produce the same quantity and quality of potatoes as before, farmers need to try out other crops such as onions and beans. Luckily, water is still available in wells on the mountains with irrigation canals either dug by hand, or more effectively using plastic tubes leading to their fields. 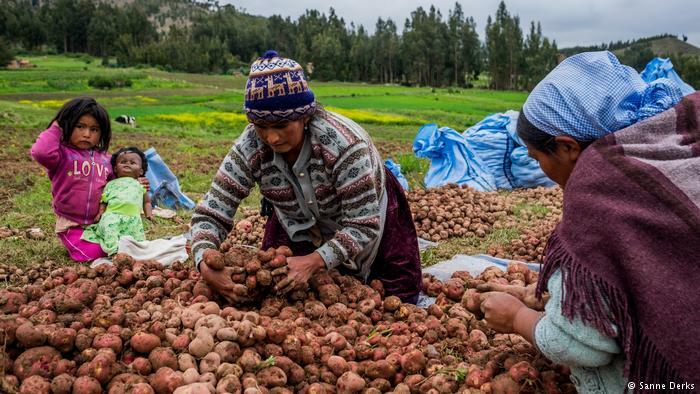 Although learning about food diversification has the advantage of giving the women the chance to grow, sell and eat a wider range of vegetables, Juanita’s neighbor Nicola Montaña (pictured above planting) says they did not make this choice freely. Rather, they were forced to take action now that their potatoes no longer grow to a decent size. 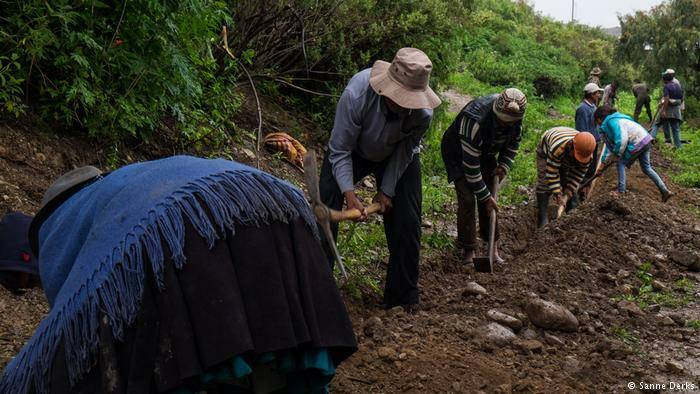 The Bolivian Institute for Empowerment of Farmer Communities (INCCA) is teaching the communities to use ecological fertilizers to help in the fight against climate change and secure a decent yield. 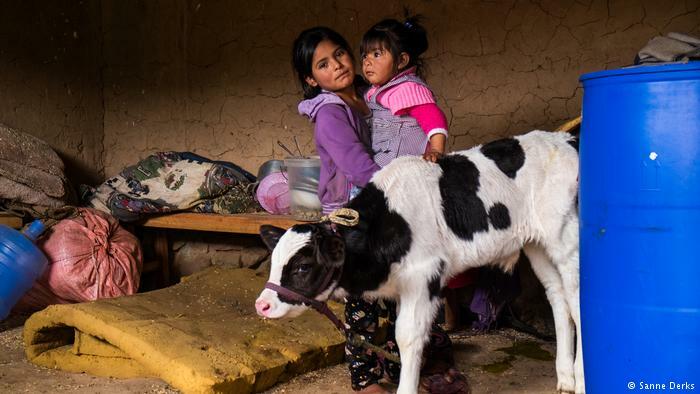 Livestock is also a feature of life in the Cochabamba valley. Cows provide milk, chicken lay eggs and sheep are kept for their wool. Occasionally an animal is slaughtered so the family has meat to eat or sell. 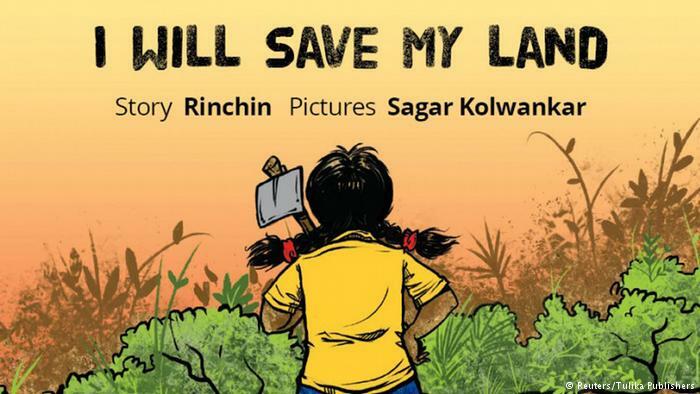 The women are the ones who take care of the animals, and it is also their role to slaughter or sell them. Trinidad Cossío (pictured above) also has a cow. 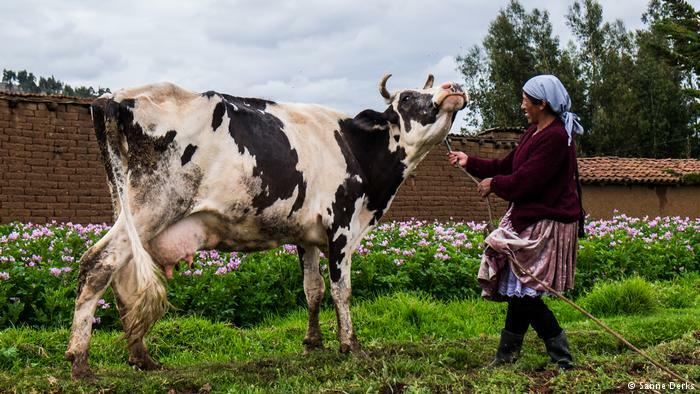 This was given to her when she became a member of a native women’s farming syndicate, the Bartolina Sisa Confederation of Campesino, Indigenous and Native Women in Bolivia, which is the leading union organization for peasant women in the country. Women involved in the union have greater economic independence through funding targeted at improving their situation, and have become more organized. Trinidad, who became a Bartolina some eight years ago, says her main reason for doing so was because she heard there was funding available. But she was also motivated by a desire to speak in public, to learn how to make decisions and to value women’s voices. In traditional gender roles, men are responsible for providing an income while women take care of the children. 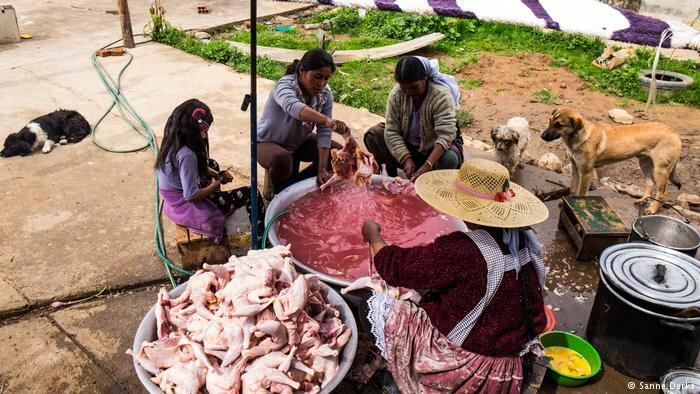 Nowadays, women also run their own businesses, such as chicherias, where they brew and sell chicha, an alcoholic beverage brewed from fermented maize. Or they make an additional income by slaughtering chickens and preparing food to sell at the local market on fridays. 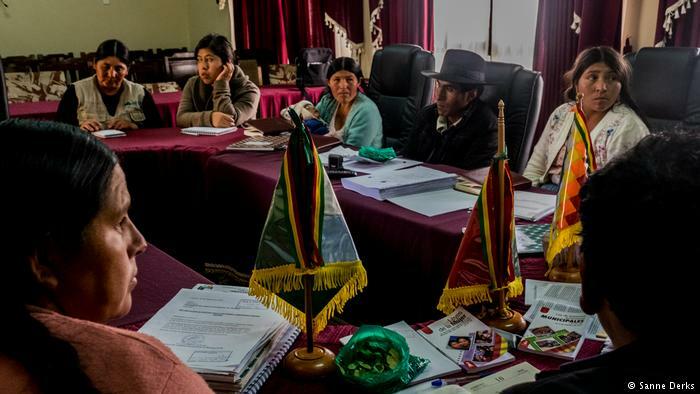 Under Bolivia’s President Evo Morales, several steps have been taken for greater gender equality, including passage of a 2005 law that calls for at least 50 percent female representation in local government. But more money has also been made available for organizations and projects such as the INCAA leadership training program that empowers women to make their own decisions and become more independent from men. Frankfurt's Museum of World Cultures shows evolving perceptions of ageing around the world. The multi-media exhibition "Grey is the New Pink — Moments of Ageing" suggests that there is no universal definition.